My thanks to everyone. To those of you who ventured to Keuka College for Lecturers’ Conference my sincere thanks. We only had 15 from Connecticut in attendance but this was good considering the distance. We ended up with a little under 700 miles on our car for the trip and I know you all had similar numbers. You also made our program great. Everyone did a wonderful job and Connecticut can be proud of you. I also want to sincerely thank all who donated toward the gift I was given. I have always said Connecticut is the best State. Thank you. Thank you! Looking ahead to next year, the conference will be held in Maine. It is the 100th Conference. Our program will be entitled "100 Years of Education". Please start looking for ideas and suggestions. The time always goes by so quickly. As for this year, deadlines are fast approaching. 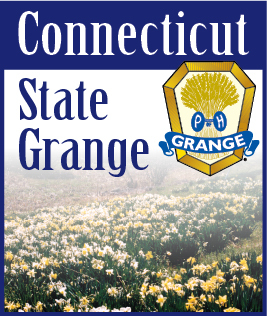 Your complete program, Should Auld Acquaintance Report and Essay entitled "What I Like About My Grange" are all due October 1st. Honor Lecturer Reports will come with the September – October Newsletter. This is also due October 1st. Enjoy the days of Autumn. They always seem so short but are so pleasant. It is a colorful season. Why not start taking pictures for next years’ photo contest now.